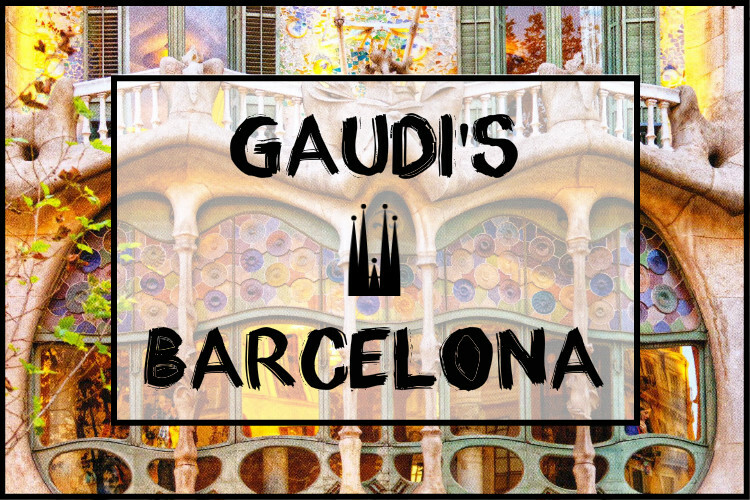 Antoni Gaudi is the famous Monderisme architect from Catalonia, Spain. He was famous for his groundbreaking ideas that changed Barcelona’s fate and position in the world of art and architecture. The majority of Gaudi’s buildings have been given the title of World Heritage Site and have surely placed Barcelona high on the list of the most beautiful cities in the world. Below is a list of all of Gaudi’s buildings in Barcelona. So what are you waiting for? Take a look! Probably the most famous landmark in Barcelona, the Sagrada Família is the crown jewel of Antoni Gaudi’s artistic work. Construction on the cathedral started in 1882 and nearly 140 years later, it still isn’t finished. It’s designed in the Gothic and Modernisme styles – Gaudi’s specialties – and is covered in intricate facades, and carvings. The cathedral is open from 9:00 to 19:00 on average and costs between 15€ – 30€ depending on the type of visit. Check the official website to get specific details. This was Gaudi’s very first house, and is considered the first display of the Modernisme style in Catalonia. In 1877 Manuel Vicens i Montaner hired Gaudi to build this house for him to live in and it eventually turned into a summer home for a new owner after Manuel died. The house is currently private property. It was bought by Amura Capital with intentions to turn it into a public museum and gallery. However, the house is currently on the market, so its fate is unknown. Even though it’s not open to the public, you can always take a stroll to Carrer de les Carolines and check out the beautiful exterior. In 1884 Gaudi was hired by his mentor Joan Martorell i Montells to build a perimeter wall, pavilion, stable and gatehouses. Now, the pavilion is located within the Botanical gardens, and is the headquarters of the Royal Gaudí Chair. The most notable feature of the development are the rod-iron dragons on the gates. The dragons were inspired by the dragon Typhus, who Hercules had defeated during his twelve labors. You can visit between 10:00 – 16:00 for 4€ only! Check out the website for more details. The Palau Güell is an 1880’s mansion that was built for the mogul Eusebi Güell along the Carrer Nou de la Rambla. The house is a stunning example of the kind of lifestyle’s these rich, Art Nouveau types lived back then. And how Gaudi was the man to deliver the lavish style they were looking for. With massive high ceilings, ballrooms, dramatic staircases and extravagant décor. The Palau is open from 10:00 – 20:00 on average and costs 12€ to visit. Check out the official website for more details! Gaudi built the College of the Teresians in 1890 with a very low budget. But as always, he was able to deliver a magnificent structure. The religious academy was designed at very unique and very odd angles that play with natural light and spacing. You can see the hint of Gaudi’s favourite accent pieces – ceramic and iron. It was declared a historical and artistic monument of interest in 1969 and has been a popular site ever since. Though much of it was destroyed in the civil war, the Collegi Santa Teresa still runs today as a pre-school and a secondary school, in a newer, larger building on the same property. This is one of Gaudi’s first works that was designed for both residence and commercial purposes. Known as one of his more subtle buildings due to its location in the city. Casa Calvet needed to be a little more conventional to fit in with the elegant community that thrived around it. The most notable features of this building are the rod-iron balconies that seem to pop out of flat brick wall. The main floor of Calvet now runs as a very elegant restaurant, also called Casa Calvet. In Catalan, Bellesguard means “beautiful view” an this could be in reference to the view from the top of it’s tower, or the view of the house itself. Also known as Casa Figueres, the manor was built in 1909 by Gaudi and his two assistants Joan Rubio and Domènec Sugrañes i Gras. The design for the house was inspired by the royal country residence of Martin, king of Aragon that used to stand on the very same property. The house is open from 10:00 – 15:00 on most occasions, but the timetables vary on several occasions. Take out a look at the official website for more details. It’s very likely that when you think of Barcelona, the Park Güell comes to mind. Gaudi constructed these gardens on Carmel Hill in 1814, but it wasn’t ready for the public until 1926. The design of the park was created during Antoni’s naturalism phase, where he looked to organic shapes and a natural flow for inspiration. It consists of of several monuments and buildings like the Greek Theatre, The Dragon Stairway and The Austria Gardens. The park is open from 8:30 – 18:15 in winter and 8:00 – 21:30 in summer. Head over to their website for more information. Right in the very centre of Barcelona’s shopping centre, lies Gaudi’s masterpiece. The building was built in 1877 and is most famous for the colourful and playful facade and rooftop. It’s considered Gaudi’s best work on a civil project and stills wow’s visitors today. Casa Batlló also has a very popular terrace, where several private events are hosted in the warmer months. The complex serves as a museum, but also a rentable event space. It’s open every day between 9:00 and 21:00 and costs 25€ for a general ticket. Check out the official website for more info. When Gaudi built the Casa Milà in 1912, most people had no idea what to think of it. The shape of the building is completely unique and like nothing the city had ever seen before. It is covered in limestone, glass and marble, and shaped by several waves that have an amazing effect on the interior of the building. Originally it was built as an apartment complex but now it functions as a museum and a venue that hosts several different art and cultural events. There are several options for viewing the building, from self-guided visits to guided tours and event packages. Check out the official website for full details on which type of visit you’d like! Commonly known as Gaudi’s Crypt, the unfinished church was commissioned to Gaudi by his loyal patron, Eusebi de Güell. Güell ran out out money though, and the project could not be completed. The church is a perfect example of Gaudi’s Modernisme style and has several of his most famous features – mosaic patterns and unique angles. The church was finished by local workers so that it could be open to the public. Colonia is open from 10:00 – 17:00 on weekdays and costs 9€ to enter. Head over to their website for more info. The Sagrada Família Schools were built in 1909 for the children of the workers who were building the Cathedral. Other children attended the schools, mostly from underprivileged families. The building is a miniature image of several of Gaudi’s work. It features several curves, limestone and roof patterns we have seen many times before. The school is now a part of the offices of the Sagrada Familia and can be visited by the public. However, as the Cathedral grows, it is getting closer and closer to the school and they will one day have to be removed to make room. Enjoy this article? Also check out our extensive list of must-see & lesser-known museums in Barcelona! And if you’re a fan of cultural experiences and enjoy visiting these galleries and museums with groups of like-minded people, join us on one of our many FREE guided visits of Barcelona’s top museums! Enjoy exploring! Saving Money to and from the Barcelona El Prat Airport !